The Miller® Fusion 160 with electric start is a 160 amp DC stick welder/generator that operates as either an engine driven welder or plug-in electric welder. Miller's PowerShift™ technology allows you to switch from engine power, for outdoor welding and power generation, to 120 volt or 240 volt input power for indoor use. The Fusion 160 comes with a Kohler CH440 13.4 HP single-cylinder gasoline engine with electric start and recoil (rope) backup AND Miller MVP™ (Multi-Voltage Plug) for plugging into 120 volt or 240 input power. Weighing only 242 pounds, the Miller Fusion 160's lightweight and multiple power option means you get two welders for the price of one. When operating on engine power, the Fusion 160 is also an auxiliary power generator that produces up to 6,500 watts of electricity. It includes one 30 amp 120/240 volt twist lock receptacle and two 20 amp 120 volt duplex receptacles. Work anywhere convenience. PowerShift technology provides weld capabilities using either the Fusion 160 gasoline engine or 120/240-volt utility power. You will have the confidence of knowing that you can weld virtually anywhere, outdoors and indoors, with just one machine. The multi-voltage plug (MV™) makes it easy to connect the welder to either 120- or 240-volt power. Less rework. The Fusion 160 uses inverter technology to deliver a smooth, stable stick arc that is forgiving of variations in arc length and travel speed, so it is easier to produce clean welds that meet specifications and avoid the time and expense of rework. Large 6.25-gallon fuel capacity leads its class. Longer run time for welder or generator usage. Electric start with recoil (rope) backup provides simple, smooth engine starts. Recoil backup eliminates the worry of a dead battery. Standard auto idle. Idles engine while not in use. Reduces fuel consumption and noise. Engine controls on front for engine switch, idle control and choke cable. Hour meter provides easy tracking of run hours for maintenance intervals. Easier to transport. Fusion 160 welder/generator weighs 222 pounds. That is up to 70 pounds less than similar machines, so moving the Fusion 160 is easier and faster. Less time is spent waiting, and more work can get done. Class-leading 6500-watt peak power of regulated power to extend power tool life. Accu-Rated™ peak generator power is usable for maximum generator loads such as plasma cutting, Millermatic® MIG welders and motor starting. Single-range amperage control makes setting amperage levels easy. Quick-reference parameter chart provides convenient amperage setting guidance. 120/240 V twist lock and 120 V GFCI duplex receptacles provide power for jobsite tools. Receptacles are circuit-breaker protected. Receptacle covers improve reliability by protecting receptacles from debris. Reliable air-cooled OHV engine ensures consistent engine performance. 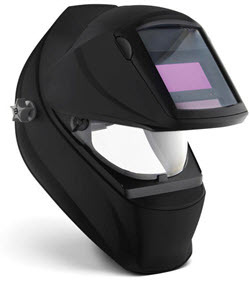 FREE Miller® Classic VSi welding hood. Hobart Welding Cable Set - No. 4, 20 ft. lead with holder and 15 ft. ground with clamp. Hobart Welding Cable Set - No. 2, 50 ft. lead with holder and 50 ft. ground with clamp. Blue canvas cover for Miller Blue Star 185 welders manufactured AFTER 9/1/2014 and Fusion 160 welders. Miller® 301246 Running Gear for your Miller Fusion 160 welder or Blue Star® 185 welder manufactured AFTER 9/1/2014. Miller® 195353 Lifting Eye Kit easily attaches to your Fusion 160 or Blue Star® 145/185 welder allowing the unit to be lifted by overhead hoist or crane. Miller® Twist Lock Adapter Cord adapts L14-30R twist lock receptacle to NEMA 6-50R 240 volt plug. 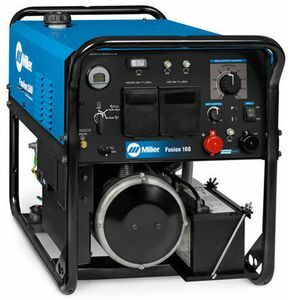 Miller Fusion 160 Welder w/Electric Start 907720001 has Tweco weld receptacles. Miller Fusion 160 Welder w/Electric Start 907720001 can do non critical scratch start dc only tig welding. You would need Weldcraft TIG Torch Power Adapter - 105Z57 and Weldcraft A-150 Valve TIG Torch Package - 150 Amp Air-Cooled WP-17V along with a flow regulator, hose and consumables.